When I was growing up, I lived far from my grandparents. I only saw them at Christmas or Thanksgiving. One magical summer my parents sent my brother and I one at a time to stay with my Dad's parents down in Fallbrook, CA. My Gran used to run a sewing club for the neighborhood girls. She'd drag out her sewing machines and start the girls on a new project, serve them lunch, tell them a story, and then send them home with their creations. I was years younger than the girls in her group, but she still let me participate. With dogged determination I mastered machine sewing in a week, coming home with a skirt I made myself, a baby doll quilt, and an apron. My Gran used to proudly say I could sew before I could write my name. My Mom used to say she was happy she didn't have to teach me, as grandmas have much more patience for that kind of thing. My Mom is an excellent seamstress. As a young woman she sewed all her clothes. I desperately wanted to do the same thing, and in middle school I was getting lots of use on her machine. In high school, I was notorious for creating the most random dresses to wear the night before an event, like the fall or spring concerts. In college I loved my costume classes, especially getting to use the industrial sewing machines that had no bells or whistles but were as fast as the wind. I made one friend's wedding dress, countless bridesmaid's dresses, and lots of elegant evening gowns that I'd wear out to the theater with Michael, which I tailored to fit me just so. I lived in the Downtown L.A. fabric district, where fabric was cheap and the selection was endless. And then we had one boy, and then the other, and sewing was less and less important, as fabric prices soared and boy toys took over every square inch of the house. I would clear a space and drag it out to create period costumes for my little theater group, or sets of angel and shepherd costumes to fill out the Christmas play at church, but that was about it. 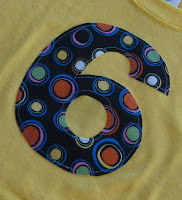 And then recently I started using it to make some applique tees for the boys and their friends. The boys became very interested in this process, and I took them with me to the fabric store several times to teach them about different types of fabric. Nathan is not very particular, he either likes something or he doesn't. And even if he doesn't, ehh, he might wear it anyway. Whatever. Benjamin on the other hand, is very exacting. He has an idea of what he wants something to look like, and he will spend a lot of time trying to find exactly the right thing. One of his girl friends who has all brothers and therefore does not like any girl things, was having a birthday and Ben decided a shirt should be made for her. I said that it could not be "girly" at all. Together Benjamin and I spent a long time going over shirt color and fabric combinations, and the final result can be seen above. Bright and cheery and appropriate for a girl with the tiny bit of pink, yet not "girly" at all. Good job Ben! Ben helped out with most of the shirt, and then decided that he wanted to make something all on his own. Like a stuffed animal. Like a snake. A blue snake. With big eyes. So together we went through all my fabric and I gave him free rein on my machine, only giving him verbal instructions. He took it so seriously! The only help I gave was to cut the tongue out of felt and to thread the needle so he could sew the button eyes on by hand.